Earlier this year I was at the Good Food Festival and had a chance to try out a salad from Farmer’s Fridge, a new healthy automated kiosk, serving fresh, nutrient-dense meals. I tried out the California Salad which included avocado and red grapes and a separately sealed dressing packet in a plastic jar. You simply pour in the dressing, shake and you have a fresh salad ready to eat. The one I tried was so good and I love that this option is out there. 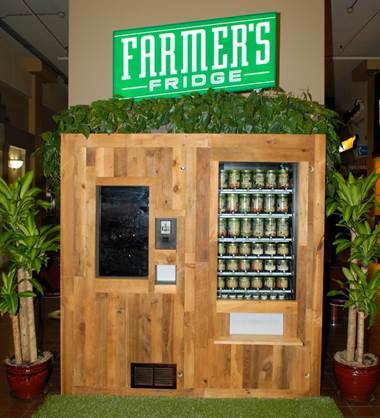 You'll find the kiosk at The Shops at North Bridge on Michigan Ave. is one of the spots you'll find Farmer's Fridge. And this weekend, you'll also find Farmer's Fridge at Taste of Chicago. Farmer's Fridge is one of 19 new vendors to be at the annual food fest that includes 60 local restaurants and vendors offering specialties that have transformed Grant Park into a foodie's paradise. The fest runs through Sunday. · Kale Caesar Salad in a Jar: Hearty kale, crunchy romaine, funky local parmesan and hand-torn ciabatta croutons tossed in a lemon-anchovy vinaigrette all served up in a Farmer's Fridge jar. Salads will be dressed and shaken to order. · Watermelon Gazpacho: Bright, refreshing and subtly sweet, the Watermelon Gazpacho is finished off with a dollop of raw cashew cream for a savory contrast. · Avocado Toast with Pickled Radish: Extra chunky avocado piled high on a thick slice of Red Hen pumpernickel bread. Garnished with pickled radish batons for a cool kick. Visit FarmersFridge.com for more information!